When we talk about reading diversely, the conversation often focuses on representation and social justice: making sure that our books don’t reinforce inequality by stereotyping, marginalizing, or erasing groups of people. This is urgently important. But what often gets left out of the conversation is how reading diversely can be a matter of pure enjoyment. For those of us who love books because they help us see the world through someone else’s eyes, reading diversely can be the icing on the cake of a spectacular reading experience. Here are our 10 favorite reasons to read diversely. What are yours? The world is diverse, so why shouldn’t our books be? It’s boring to only read about people just like you. Walking in someone else’s shoes builds empathy. Diverse books make us feel seen and understood. Reading diversely can help turn nonreaders into readers. Understanding different cultures helps us succeed in a global world. Magic happens when we step outside of our comfort zones. Diverse books redefine who and what we can be. Click here for a larger image. Want a copy of our Reading Diversely poster? Comment below with your name and email address and we’ll send one out to you! (US addresses only). Why do YOU think it’s important to read diversely? Love this poster. I’ve been making an effort to read more diverse books and I am enjoying it. YES! My story is important; your story is important. When I read your story, I become familiar and comfortable with you. When you read my story, I am appreciative that you are interested and open to my difference. I’d love a poster please–thanks! I work with a large, diverse student body. It only makes sense that my library collection should reflect my school population. This past year, I was fortunate to receive a $500 grant from our district-level PTA council to purchase diverse books. The books are flying off the shelves! Michelle, I am currently working as a coordinator for a literacy campaign that is creating programming around diverse books – I would love to hear about what books you chose! Do you have a list you could share? Thanks for providing these posters. I would like one for the classroom, school library, and town library if you have enough available. Very important message especially here in NH. where we have economic and other forms of diversity. Reading diversely expands our world view! Love the poster! I’d love a copy! Please email kmarford@bsu.edu. Thank you kindly. Hopefully, publishers will read and reflect on the ten favorite reasons. Understanding each other better can lead to respect, and respect can lead to more harmonious relationships. I would appreciate receiving the poster. My email is Shantenikia@aol.com. Please contact if you require a mailing address. Thanks Much. Reading diverse books means you get to have all the pieces in the puzzle and thus you see the whole, big picture. This is fabulous. As a former teacher and reading specialist, I completely agree that we need be reading more diverse literature with young people. I would love a poster bmartinez@adl.org Thanks! Book’em serves many Metro Nashville Public Schools, which are extremely diverse in many different ways. We provide reading volunteers and new books for economically disadvantaged students. It is essential that we provide a great variety of books, including ones that showcase all types of diversity, so that every student can find books that appeal to them. We want students to see themselves and others in the books we have available. Having a diverse selection of books will motivate students to read more and thus develop stronger literacy skills. We would like a poster to put up in our book room where our reading volunteers can see it when they are picking out books to read aloud and to give to the students. Thanks! My email is ceo@bookem-kids.org. As a teacher educator, I encourage my college students to read diversely so that they may experience stories as unique as the children they will teach! Reading diversely opens our minds to the reality of what our world actually is. It gives us an acceptance and value in ourselves and fosters appreciation of others. It’s the only way to read, and it starts at home! I would love to hang my first poster there! When I visit someone else’s mind and heart for a while — what a privilege! — I learn, feel, and understand more. I end up making more connections, both within myself and with other people, than I otherwise would. Yes, I would love a copy of your poster! My email address is amysleetai@gmail.com. Thanks! Thank you for this poster, and for all your ongoing leadership in the arena of diversity in children’s literature. Thank you also for making it available for download! I am sending it to our Print Shop so we can have one in each of our school libraries. If all your creative forces could also develop one that features boys or gender neutral characters, that would be delightful! I agree with the statements on the poster! Diverse reading enriches your life and when books are chosen wisely can Unteach prejudice, misperceptions and stereotypes. Hoping the poster will get kids thinking…. Yes, please! I’d love a poster for my classroom. I’d love one! My email is katrina.e.dillon@gmail.com. Thank you! We need diverse books to illuminate the ignored voices of the majority in our societies! What a great list Building empathy stands out as a reason in my book. I would love a poster. Please send to Donna Eggleston. Email address lewdonna@rochester.rr.com. Thank you. This poster is great! I am giving a workshop next month on diversity in fiction and would love to be able to offer these to attendees. Please email me if this is possible at raefordeditor@gmail.com. I work in a diverse school, but I grew up somewhere that wasn’t as diverse. Books opened my ears to the voices of people outside my own community, my own time and place. I got to have a conversation with people who weren’t like my classmates or family, which made me curious about the world and everyone in it. They keep doing that for me! Would love a poster! Caroline Benton bentonc@district279.org Thanks! We’d love to put this poster up in our bookstore – please send us one! I am the language support teacher at my campus We have bilingual students and ESL students from many different countries. Students feel validated and important when they are reading or being read to with books from there culture. Also when you expose them to other diverse books they can see the similarities and differences in cultures and learn from them. Diversity is key in making this world a better place to live and who better to start with but with kids. I look forward to posting this where central staff can read it and remember all the different children we are serving in our district. We would love one of these beautiful posters to put up in our bookstore! Reading diversely makes us fear differences less and make connections within ourselves and with others. Great poster! Thank you! Diverse books make me proud to be a teacher. They reflect my life and the lives of my students back to me and open windows to new worlds. I want that poster so very much! This poster goes to the heart of what I teach pre-service elementary teachers! My email is wheelergirl3@yahoo.com. I would love to gift this poster to the new school that just opened in our diverse neighborhood. It is important to read diversely so that other people are heard. Students need to know that they should value everyone. As an teacher and an author, I know how children react when the child in a book looks like, acts like and lives like they do. It builds a bridge to other books and to a love of reading . We’d love a poster! Thank you! Mirrors and windows–both are so important! I would love this poster to hang in my library! esoeiro@cpsd.us Thank you! Love it, says everything that I teach my students who will be teaching one day. We would love a poster! Thanks! Reading diversely gives me different perspectives on the world. It’s not just what I see from my vantage point. Tamzin Malone, mainstreetbooks@gmail.com. I’d love a poster! Thanks so much! It is troubling that this is not the no-brainer it should be for schools and families. Love this, and would be honored to have a poster up in my school! My email is cmingus@sabotatstonypoint.org, and please contact me if you need my mailing address. Keep up the fabulous work. Great poster! Would love a copy. I am Jennifer Dines, and my e-mail is jdines@bostonpublicschools.org. I think it’s important to read diversely because reading builds empathy for other people, especially those who we perceive as being “other” than ourselves and who we may initially avoid, resist, or close off. Two books that have recently helped me to “walk in another’s shoes” are The Book of Unknown Americans by Cristina Henríquez and The Corner by David Simon. Another favorite of mine is An Island Like You by Judith Ortiz-Cofer. As an educator and parent, I appreciate the message on this poster because I know the importance for children to see themselves and their lives reflected in books in order to establish their connectedness with the printed word. This is a great list! Will send this to the Cincinnati Public Library. This poster would be great for there. We all need to read diversely because our world is diverse and through exposing young children to other peoples lives, other world views, experiences and thoughts, we prepare them for a rich life. Books need to be diverse because the Book Industry has a responsibility to ALL children to get those stories out. More authors of color and more diverse books are critically needed for children of color to see themselves in fantastical stories (not just historical) and for non children of color to be exposed to something new. Would love to have a poster, thanks! I would love a poster! I always try to include diverse books in my literary life! Makes me a more informed & compassionate! Hi Lee & Low! 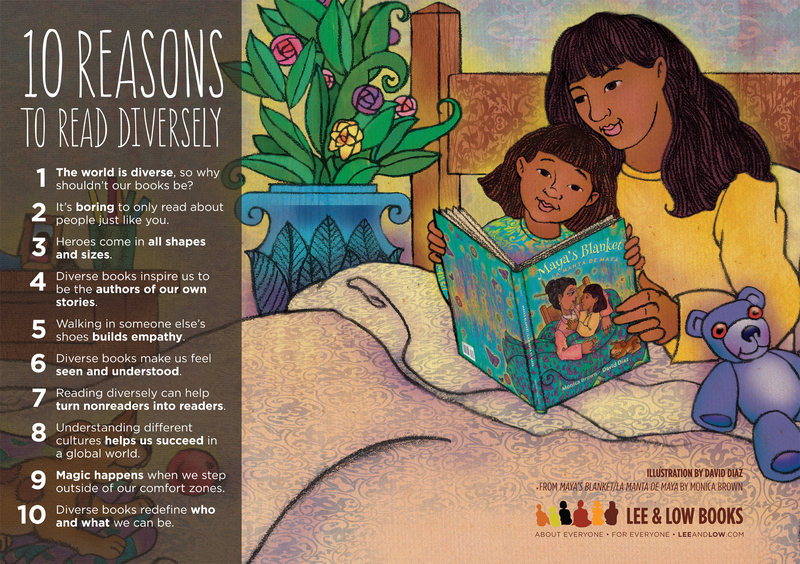 I love this poster—the illustration and the list of 10 reasons to read diversely. Thank you for the generous offer to receive a poster. Diverse literature is important to me because we all need mirrors and windows! Building empathy through reading diverse books is so essential for students of all races, religions, sexual identities, socioeconomic backgrounds, etc. I’d love one of these posters! Thank you! Diverse literature helps us understand each other better. Yes, as an African American author, diversity is sorely needed in our kid’s books because they need to read about people they can identify with. Our world is diverse! Because you never know what life has in store for you next! Teaching through multicultural and social justice literature in the classroom can broaden perspectives. Reading diversely reminds us that we are not alone in this world, but that we share this world with people of many backgrounds and beliefs. I would like a poster! Please send me a poster! Asmith@sharon.k12.ma.us. I would also love a poster. Contact me at nclooney@gmail.com. What a great poster! I would love a copy. Thank you. Reading is like traveling- while it is comforting to go back to a favorite place from time to time, visiting different places, experiencing different ways to forge a living, as well as meeting + interacting with people (young +old) with different perspectives on the human condition enrich + amplify your own views on life. And, thank for offering to share this beautiful poster; we will be raffling it at a children’s reading activity we’re planning for this Fall. To read diversely is to soar beyond the boundaries of one’s room, one’s home, one’s circle of familiar. I need a copy of this poster for my school. I would love this poster for my classroom! I would love a poster please…bdteach3197@yahoo.com. Thanks! Would love and appreciate a poster!!! oops! I meant “text” sorry for the typo! Lovely poster. Would be a great addition to our parent ed resources. I teach sixth graders and realized a few years ago that I didn’t have enough books that reflected the diversity of the world we live in. Now, I watch my students actively seeking to read books about people like themselves, but also about people and lives that are different. I love the way children’s lit has exploded with variety, including more books thatreflectbourcdiversity. Would love a poster- thank you! I try to reach the kids mainstream teaching leaves behind. They will move mountains for you, once someone acknowledges and respects their diversity in the group. I love this poster and would love to share it with my students. Reading diverse literature makes readers more empathetic and more understanding of others! Because it allows you to think about others and view through another lens! Great insight! Please may I have a poster? This is a beautiful poster! My students will love learning about how reading books with diverse characters can help them grow as individuals and as members of our diverse community. What a great conversation-starter with colleagues and families! Wonderful comments and reasons. My first thought is that everyone should be able to see themselves in books. Books give one the opportunity to view worlds not lived. Thank you for making these books available. I believe that our job is to teach children what it is to be human by teaching diversity. By reading to my children I encourage knowledge, understanding, compassion and growth. To awaken the desire to learn through books and conversion is a step to unifying humanity. So our whole school is working on the large theme of Diversity. The poster is cool and I’d like one, but the site – which was unknown to me previously – will be a wonderful source for the teachers in our school. Thanks. Awesome; love it! I’m looking forward to putting a copy of that up in our children’s room! It increases your critical thinking skills. Would love a poster, thanks! Melissa Tabeek, melissa.tabeek@gmail.com. I would love a poster. Reading is part of the process, in the search for understanding and acceptance. Reading diversely makes us all top-notch citizens! A great visual for our educational initiative. We need diverse books because we have many diverse students who want to read. People, especially young adults and students, want to see themselves reflected in books that they read. They will know that they are not alone – that there are others like them. The school where I teach seeks to be inclusive, innovative, and is committed to honoring and developing each person’s gifts. As part of that I strive to build a diverse classroom library and also try to display posters representing many types of diversity to help all of my students feel valued, capable, and inspired. Your Read Diversely poster would be a fabulous addition to my 3rd/4th grade classroom. Thank you! I would love a poster! Thank you so much. It’s important to read diversely to confront hegemony and subvert systemic racism from the root. It’s important to read diversely because issues of power are enacted in schools, and teachers have a responsibility to create equitable and humane learners with the knowledge to change the world. Diversity is our reality and reading diversely helps us to put ourselves in someone else’s shoes and gain new perspectives. We learn to appreciate and celebrate our likenesses and our differences. When we read diversely we see ourselves on others & they become a part of us! Yes! I would appreciate a poster! I would like a poster. Dickinson_59@hotmail.com Thanks! I would love a poster for my school. I would love a poster for my school! For all my students who have never read a book about someone who looks like them. And for those who have have seen themselves but not seen others. To recognize someone is the beginning of understanding. It’s important for students to see themselves and their worlds in the books they read as well as to learn about people different from themselves. Would love the poster…thank you! Reading about all kinds of people, places and ethnicities enriches myself and all students! When we read diversely, we challenge ourselves. We spark deeper thinking and a better understanding of the world around us and of ourselves. It’s important to read diversely, because it makes you a better, more interesting and compassionate person if you know about experiences other than your own. This poster would be wonderful in our school library! I would love a copy of this poster. Thanks! I love this and would hang the poster with pride! Oh, please! My classroom needs this message. I would love a copy for my language classroom 😉 Thanks! Books are like windows to worlds known and unknown or unfamiliar. Reading diverse books to children help them to better understand their own world and the greater world around us all. Care, compassion, understanding are all things we can learn from reading diverse books; without really trying. It’s wonderful that diverse books are available to children. They can travel the world and meet so many people, try different foods, see different family structures, religious practice, customs. My kids…our kids are better for it. Reading books outside my culture encourages me to think outside my box. I would love a poster to share with students at SU. Diversity is important because we should be giving children accurate representations of themselves and empower them to seek happiness, comfort, and pride in their identities! Would love one if they’re still available for a giveaway. I have always thought of what you talk about in this article. Yes, I would love a poster. Merci! Our district librarians are really emphasizing the need for diverse books, and some worked on a summer project around this as well! Diversity adds the flavor and the spice to life. Diversity enlightens us and leads us to innovation. Please send me one of those awesome posters! My librarian assistant, a young black woman, said to me one day, “there are few people like me in books.” She’s right and that made me step up even more my effort to find books featuring diverse people/children. We are all different and it is fun to see our differences in books. I love this!!! I just retweeted it! We need more books of colorful faces! Please send us some posters to our school and I’ll give them to my staff. In our fairly ethno-centric community, reading diversely allows my students to see that their world isn’t the only world. My students are from all over the world. I read to them about their home countries and places they’ve never been. “Visibility”, “Voice”, and “Validation” – powerful and empowering reasons to read diversely! Yes – I would like a poster. Thanks. Its important to read diverse books because classrooms are diverse! our students need to make connections with characters… they neen to see themselves in order to be engaged! i would love a poster for my room!!!! Forgot to enter my email to get a poster…emilyfran280@live.com Would love a copy!!!!!! Rich conversations happen from reading about all sorts of people in all sorts of settings. Wonderful! As a person with a disability, I felt a thrill the first time I saw Mama Zooms! Love the poster. This would be a great addition to our library. I’d love one too, thanks. I will proudly display this in my Head Start classroom! Children can grow in empathy and tolerance! A great reminder for the students, teachers and parents in our school. Looking forward to hanging this! Please send me a poster. It’s wonderful and I would love to pin this up in my school. Sharing the counter-narrative can help break down stereotypes which, in turn, can break down systemic racism in our systems. I read diversely because it helps me put myself into my students’ shoes, understand and empathize with them, and recommend good books to them. Thank you! I would like to display this poster in my classroom. Thank you. Making the purchase of diverse books a priority in our library this year. Please send us a copy! I would love a poster for our school library! Mirrors, Windows and Sliding Glass Doors! We at the Center for Teaching through Children’s Books at National Louis University would be proud to display your beautiful poster, thank you! Literature can and should be both a window and a mirror. Thanks for all of your great work. I’d love a poster, too! May I please have a poster (plus a bazillion more to give to my students)? I’d love a poster for my classroom! Thank you! Thanks for the support everyone! We were blown away by the response! Unfortunately we’re out of posters, so we won’t be able to give away anymore.